I-Meet came to attention through google alerts. If you are working in or do business with the Caribbean, this is an option to connect with partners, clients, etc. 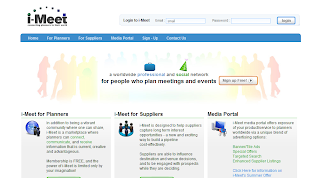 In addition to being a vibrant community where one can share, i-Meet is a marketplace where planners and suppliers can connect, communicate, and receive information that is current, creative and advantageous. Membership is FREE, and the power of i-MEET is limited only by your imagination! At i-Meet, planners enjoy a powerful combination of worldwide contacts, relevant industry information and insider intelligence that will improve their careers and their earnings potential. Also designed for occasional and social event planners, students interested in the hospitality industry, and anyone else who wants to be connected to this global community, i-Meet gives you what you need!